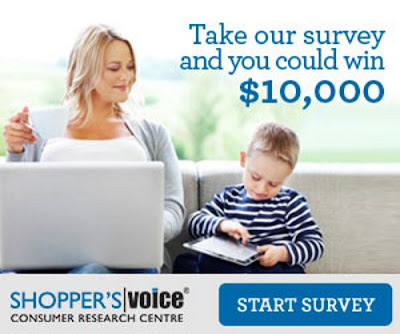 Have you completed the Shopper's Voice 2016 Consumer Product Survey of Canada survey? I hope you have because when you do you will be eligible for Free Samples and Coupons throughout the year! You'll also be entered to win $1000 from the Shopper's Voice sweepstakes as well as a draw of a monthly prize of $500 gift card. Plus keep your eyes peeled on your inbox for great offers coming! The survey is pretty straight forward and just asks about what products you use and enjoy. Samplers will be starting soon, so don't delay in completing the survey at the link below! Please note, only do this survey once, doing it over and over does not get you more samples/coupons and is just considered a duplicate and deleted from the system. Click here to complete the Shopper's Voice survey.